The D.C. team after they represented Angola. Photo courtesy of CSUN Model UN Team. 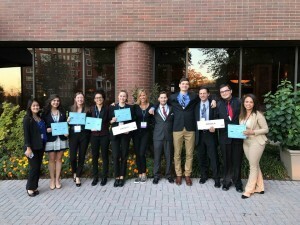 California State University, Northridge’s Model United Nations team took top honors in competitions against some of the world’s best teams last month. This marks the fourth year in a row for the accomplishment. Twenty-four CSUN student delegates competed in two conferences, one in Washington, D.C., on Nov. 18-20 and the other in Seattle on Nov. 11-13. The teams participated in committees to discuss topics such as global security, human rights and atomic energy. In Washington, D.C., CSUN represented the country of Angola against teams from around the world, taking first place for three committees. Ten students in Seattle won in three more committee competitions, representing various countries. The students were required to write position papers about their topic, make speeches and then work together to draft a solution to a set problem. Senior political science majors Jennifer Veitia and Brooke Cichosz joined the Model UN team in fall 2015. This year, they served as the head delegates. In that role, they advised and supported other students, ensuring that they were prepared for every aspect of the competitions. “I feel accomplished. It is something we wanted to do, and we worked hard to continue the legacy,” said Veitia. The CSUN Model UN team’s longstanding reputation for success stems from that work ethic. The next conference will take place in New York in April 2017.